There are no doors found. 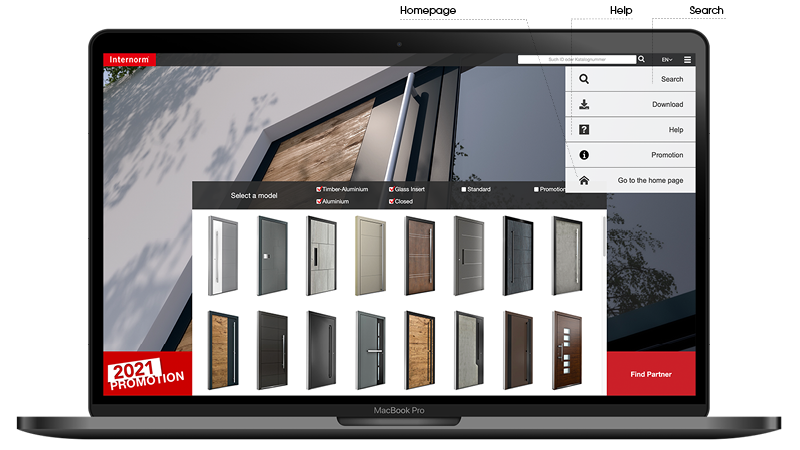 The contents of the Intermorm-Doordesigner are protected by copyright. All text, pictures, graphics script and other content are the intellectual property of Internorm. The Internorm dorrdesigner may not, either completely or in part, be edited, copied, distributed, broadcast, nor its content delivered without prior written consent, neither may it be electronically, magnetically nor optically reproduced. The exception to this is your not exclusive authorisation regarding personal use of the Internorm-Homepage, including permission to make single print-outs for personal use. You will undertake to refrain from any action which would facilitate the imitation of the homepage, the construction of the layout or the representation of individual products by yourself or any other person or persons. Links to the Internorm-Homepage should be displayed in a new browser window, provided the Link does not refer to www.ifn-holding.com, but instead to a sub-page, which for technical reasons, should first be discussed with the web-master. Any display of the Internorm-Homepage within an 'external' frame is strictly prohibited. Because of computer-technological circumstances, there may be colour variations between the Homepage representation and the original product. Your Internorm specialist dealer will be happy to show you the original colours. We reserve the right to alter measurements and/or appearance of the product. The Internorm-Homepage can best be displayed using MS Internet Explorer, minimum veres. 6.0 (PC) and with a screen resolution of 1024x768 pixels. We apologise for any problems with display resulting from a lower screen resolution or browser version or the use of Mac applications. Subject to technical changes and typing errors. The displayed prices in the door designer are the recommended retail prices for the product. This price does not include; size, dismantling, disposal or installation. The final sales price can be obtained from a distribution partner in your area, where you will be able to discuss your requirements further. 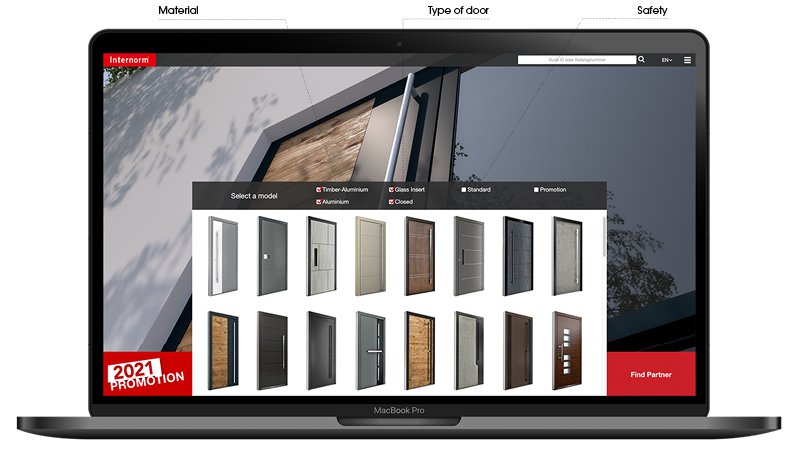 The Internorm Door Designer enables you to find the right entrance door suited to your individual taste. You can define elements with it that influence the outside appearance of your entrance door. Your local Internorm Partner will provide you with continuous professional advice. They will also be able to provide you with useful additional information about finger print or extra design elements such as LED lighting. You will find our doors on the welcome page. You can filter your door by basic material thus Aluminum or Wood / Aluminum. The user menu can be found on the top of the page on the right side. Within the user menu you will find the home link, a search function for your already configurated door and a help function to start the help tour. 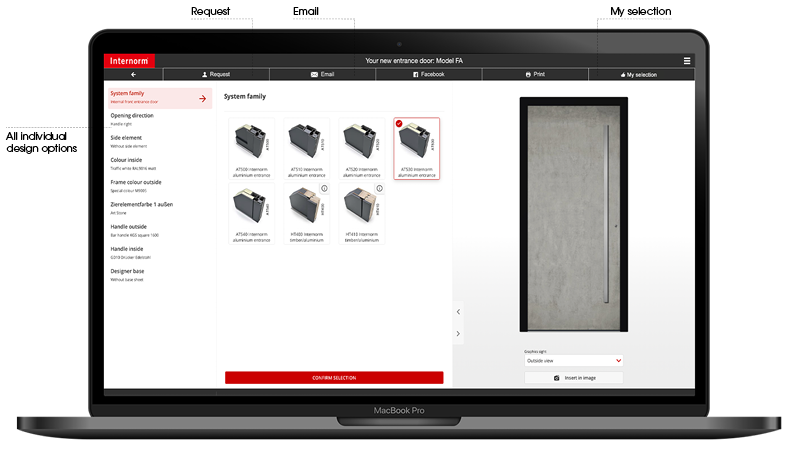 The image above shows all important functions.With the “request icon” you will forward your requested door to Internorm for further processing. The arrow icon „upload image“ opens the upload function for your personal pictures that can be adjusted by choosing the “fitting icon”. The “information icon” shows you details about your door. 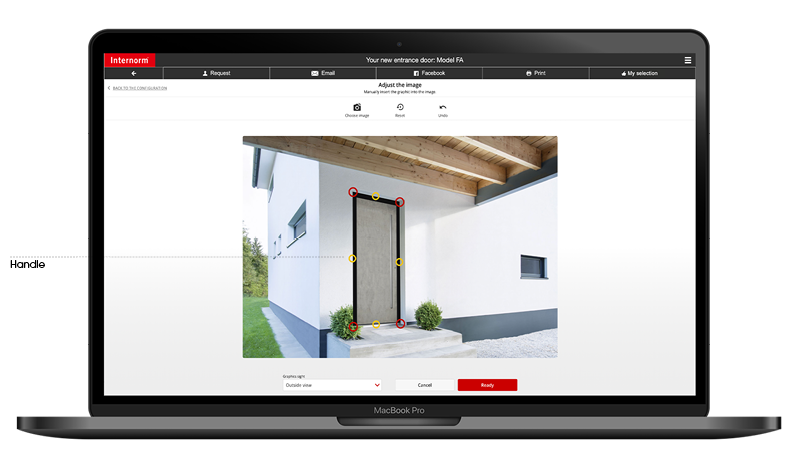 The upload function allows to upload an image to fit your door into it. 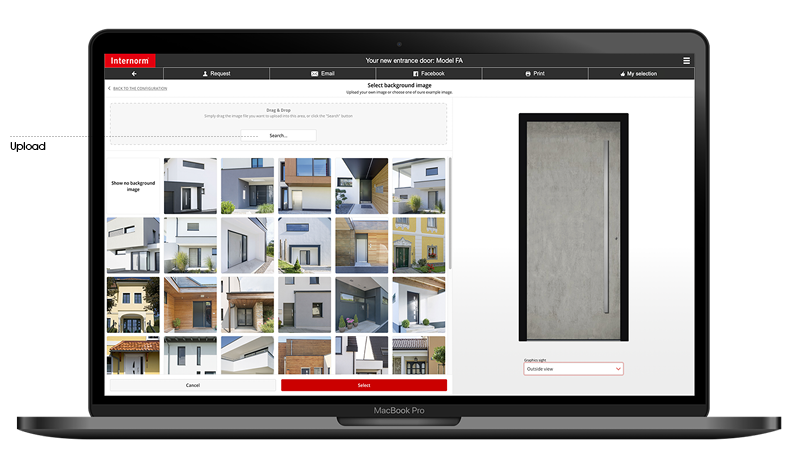 The fitting in of your door into the chosen image can be done by using the round patterns.